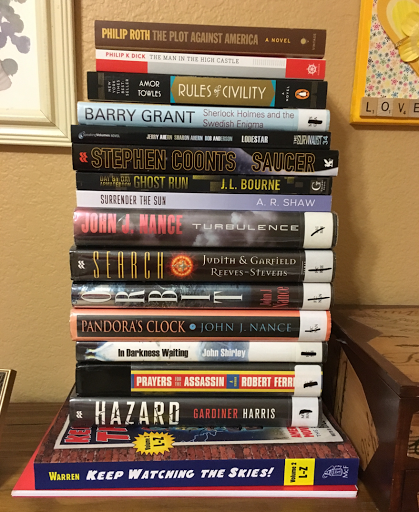 Last weekend, we stopped in at our local library and discovered there was a book sale - a roomful of books that were being taken out of circulation, most for only 5 cents. I picked up one, along with the two books I checked out. 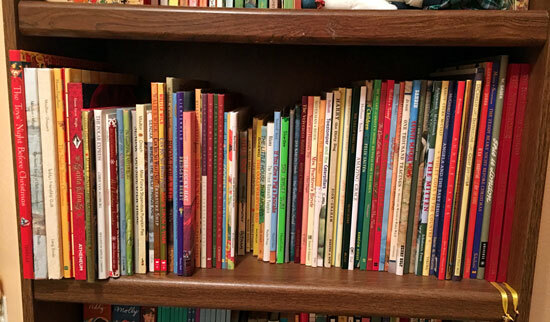 Robbie brought home 12 books and added them to his pile on the dresser. Since we both already have a stack of books on our nightstands, we laughed and agreed that we didn't need any more books for a while. And then the mail came . . .
On Wednesday, Robbie received a package from Amazon. We both laughed when he opened it to discover a book that he had pre-ordered a while back! Once again, we agreed we didn't need any new books for a while. On Thursday, this little pile was delivered! 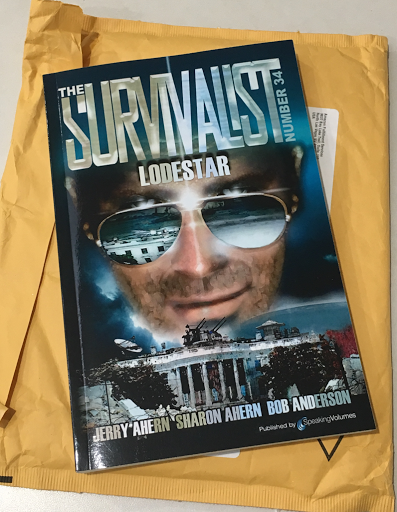 The top package contained yet another book that Robbie had pre-ordered, the next in a series he enjoys. 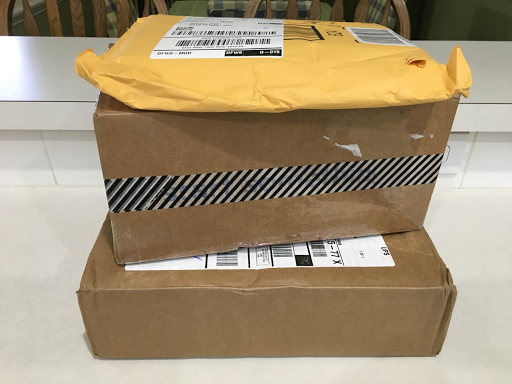 That box in the middle with the black washi tape around it is my February book swap package from my sister. (I'll share more about that one in a future post.) 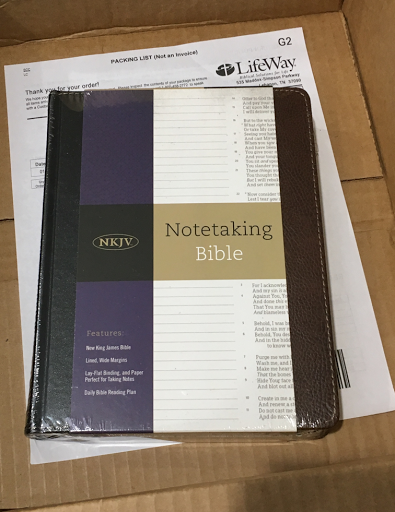 The final box housed a new Bible from B&H Publishers (which I received free in exchange for an honest review - coming soon). On Friday . . . yep, you guessed it . . . another box arrived! This one contained a book from Booklook Bloggers (which I also received free in exchange for an honest review - coming soon). Needless to say, there are two very happy readers here this week! We're slowly but surely working our way through those piles of great books. But, really, we don't need any more for awhile!! Waving to all the Mondayers joining in with Sian this year as we share a favorite piece (or two or three) of mail from the previous week. When my sister and I decided to participate in a monthly book swap this year, she asked if she could send me a blog topic each month. She set a few "rules" - no scouring my blog for previous posts before completing this post, no changing the post after it's written, must be posted by the last day of the month, have FUN! 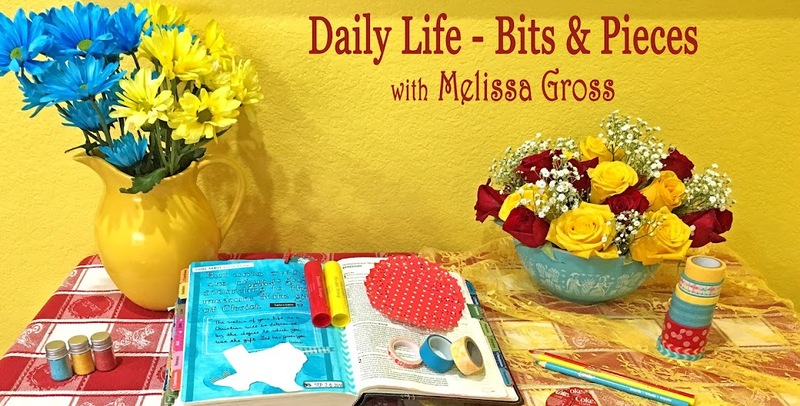 After several months of slow blogging at the end of last year, I thought this was a great idea and would help me be more ACTIVE here at Daily Life - Bits & Pieces. I did not, however, anticipate how difficult the first topic would be! I've been pondering this topic since the beginning of the year and have to admit I've had a difficult time choosing who to write about.There are so many people that I admire for a variety of reasons. I hope you'll enjoy learning more about five of them today. I don't remember when I first read The Hiding Place by Corrie ten Boom, sometime in my early teens probably, but her story had a profound effect on me. (Read my review of the book HERE.) Over the years, I've read many other books by Corrie ten Boom and have always been awed by her ability to continue writing and speaking well into her 80s. Despite the fact that she spent time in a concentration camp (and was "accidentally" released only a few days before all the women her age at that camp were exterminated), she spread the message that it is essential for us to live a life of forgiveness. The story I most remember is when a former prison guard came up to her after she had spoken on forgiveness. She recognized this guard and stood frozen for a moment when he stuck his hand out to shake hers. Could she really forgive this person who had been so cruel? Yes, she decided, with God's help, she could and did forgive those whose atrocious acts led to her father and sister dying in a prison/concentration camp. She does not sugarcoat the fact that it was a very difficult choice to practice forgiveness, yet it was essential. I met Dr. William F. White in the late 1990s. He was the professor for one of my pedagogy classes at Lamar University in Beaumont, Texas. I had returned to college to obtain my teaching certification. Dr. White's philosophy of education can be summed up in one sentence: The attitude of the teacher affects the attitude of the student. I was excited to begin this class and knew it would be pivotal in my development as a teacher. Dr. White was an enthusiastic teacher! Miss Linnie was also very compassionate. During a very difficult time in my life, she called me and simply said, "I'm not sure what's happening in your life right now, but I felt that God wanted me to call and let you know that I love you." She'll never know how much that call meant to me that day or how I've used that example of heeding the Lord's voice in my teaching over the years. David & Anne Bleakley were members of the same church as Miss Linnie. Everyone called them Daddy Dave and Mama Anne. They, too, went out of their way to help others. (Read about the time they gifted me with a washer and dryer HERE.) 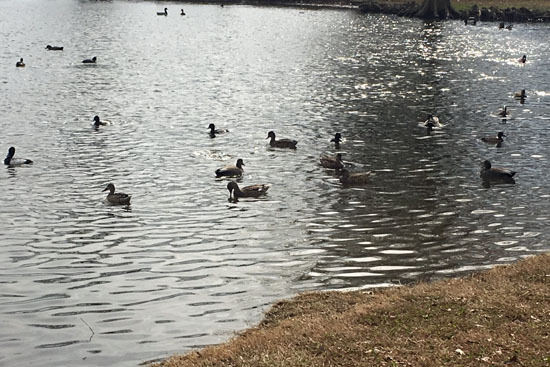 However, my favorite memory is of the day I stopped by their house (with a casserole and cookies, of course) after Daddy Dave had been diagnosed with cancer. My heart was hurting and sad as I hugged Daddy Dave and expressed how sorry I was to hear the news. But I'll never forget the look on his face, the smile and twinkle in his eye, as he said, "I don't know why this is happening, but I can hardly wait to see how God is going to use me to bless others as I go through my treatment." Daddy Dave was actually excited about the opportunity to share the love of God with others!! When I visited him in the hospital after his surgery, he spent time telling me about the nurses and other members of the hospital staff that he was meeting and praying for each day. He was such a selfless patient, always thinking of others even as he suffered with pain. In fact, he requested that anyone who wanted to do something for him should purchase shoes to be donated to the Shoes for Orphans program hosted by Buckner International, the organization that also runs the orphanage where he grew up. 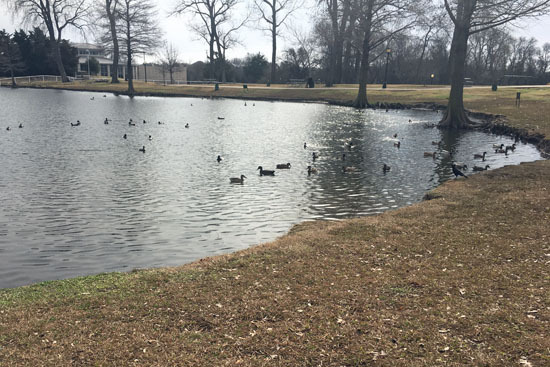 His request brought in hundreds of pairs of shoes and quite a few monetary donations, which brought him much pleasure as he recovered and eventually returned to his normal routines. 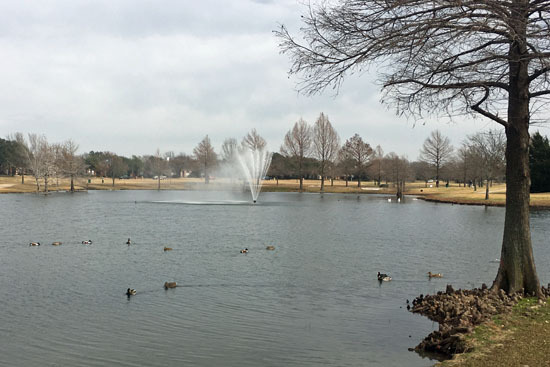 When I moved to Rockwall, Texas, a week after marrying Robbie, I didn't know anyone except him in this area. 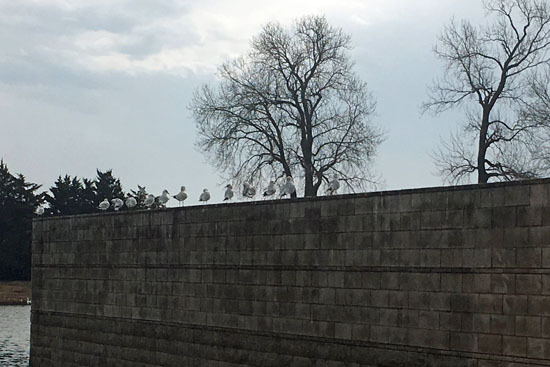 We began attending church and soon made friends. The church had lots of small groups available, and Mrs. Faye Holt and Ms. Ruthie Allison led a group called Mentors & Moms. These two ladies (both in their 70s at the time) wanted to encourage and mentor younger women in their lives and walk with the Lord. *each one possessed a personality trait that I'd like to cultivate in my own life. *each one was older, yet still willing to invest in others, especially those of younger generations. *each one was only in my life for a short period of time (or really not at all in the case of Corrie ten Boom). *each one taught by example, living out these lessons in everyday life. I'm so blessed to have the example of these individuals in my life! If you had to choose five people you admire, who would you pick and why? 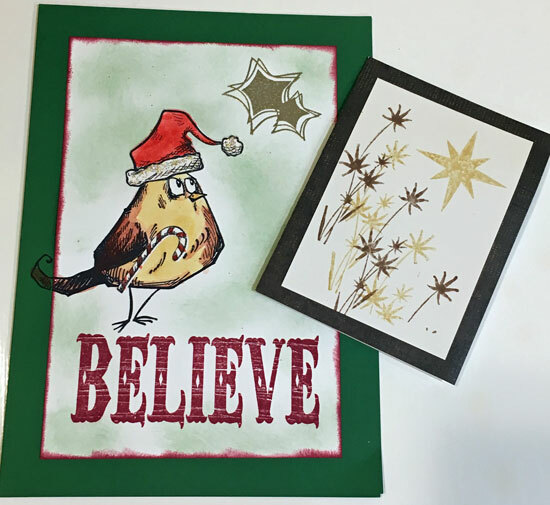 Yesterday my sister Brenda was clicking around the WOYWW posts and discovered a Christmas Card Challenge site that she thought I might enjoy since I send a lot of Christmas cards each year. . . and she was correct! 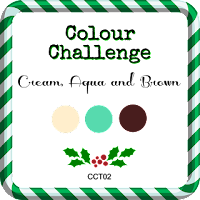 Every two weeks there's a new challenge based on a sketch or color combo or technique/stash or theme. 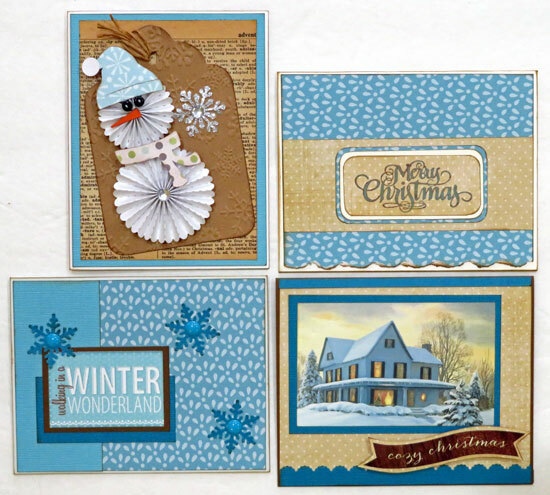 The current challenge is to create a Christmas card using only creams, aquas and browns. 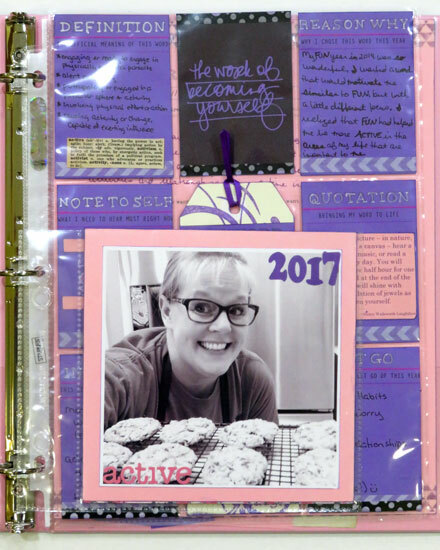 One of my goals this year is to ACTIVELY use my stash, so I began by flipping through the Christmas section in my embellishments notebook. I pulled a few items that I thought might work for the challenge. 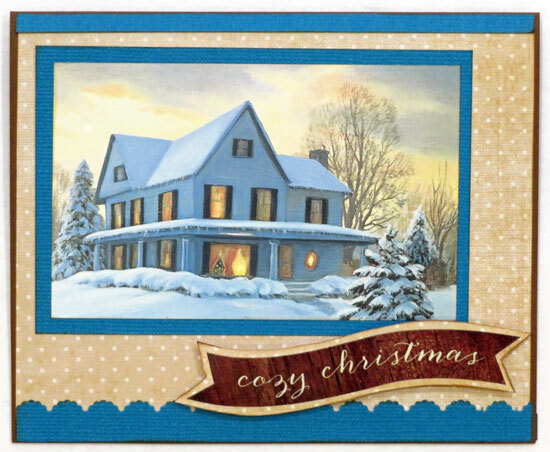 I pulled out some card bases, paper scraps, chalking ink, stamps and a Broken China Tim Holtz Distress Ink pad and started by creating a simple card using a pre-made cream card base, patterned papers, and a stamped sentiment. I knew once I pulled out supplies that I'd create more than one card! This second card is my favorite. I started with the printed image that I cut from a card front and added to my stash several years ago. 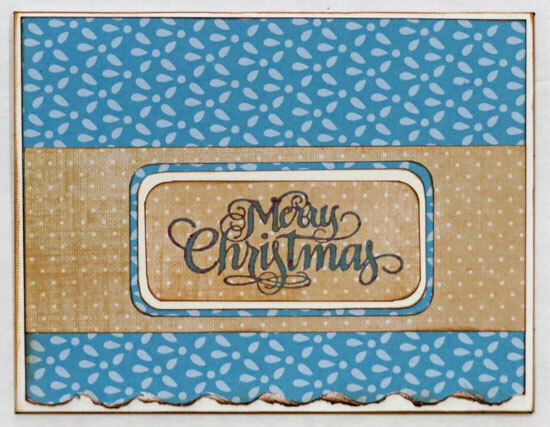 I made a card base with brown cardstock, then added aqua cardstock, patterned paper and a sentiment sticker. I really wanted to use that snowman tag, too, although since it is white (rather than cream) I know it doesn't fit the challenge criteria. I had the remainder of the page from my old dictionary still out (after cutting out ACTIVE for my OLW notebook), and when I noticed that advent was the guide word, I knew it should be on a card. 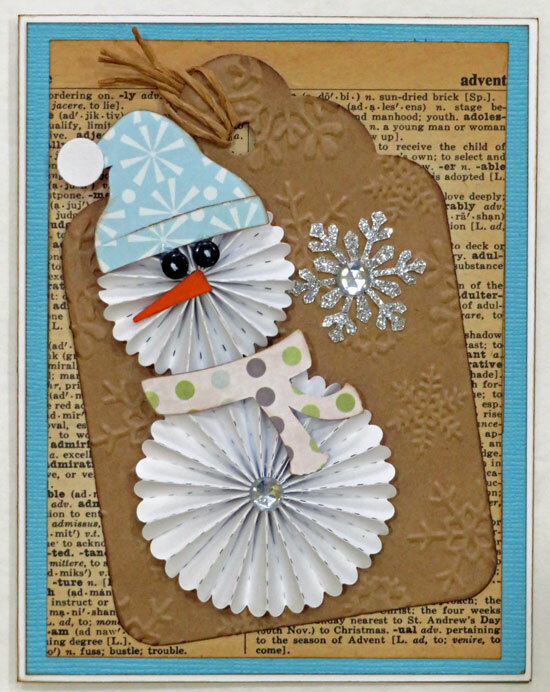 I made a card base from white cardstock, adhered aqua cardstock, then the dictionary page and that snowman tag for this great dimensional card. And, of course, since I had that sheet of winter-themed stickers already out, it seemed only logical that I use at least one on a card. 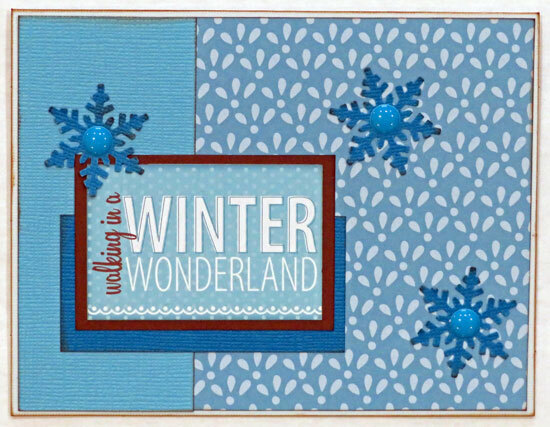 I had a very light blue pre-made card base, which worked perfect with an assortment of cardstocks, patterned papers, and punched snowflakes embellished with enamel dots. When I start my Christmas cards each year, I like to choose an interior design that will be consistent as I create throughout the year. 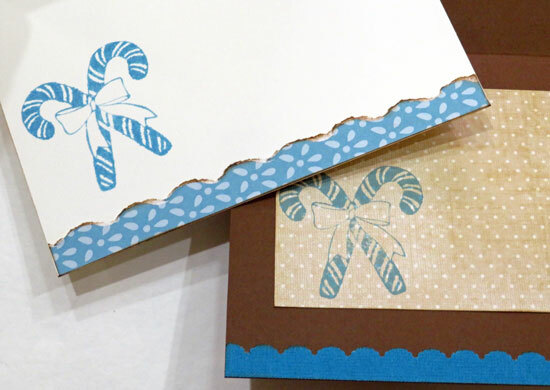 For 2017, I'll add a strip of paper along the bottom edge of the card, along with a stamped peppermint sticks image. I believe this is the earliest I've ever started my Christmas cards! I hadn't planned to create four cards, but the INSPIRATION was obviously just right . . . and it was lots of FUN! 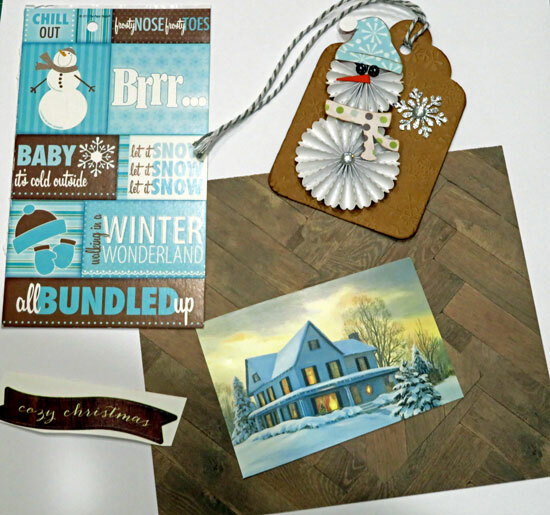 If you want to get an early start on your Christmas cards, jump over and join in the Christmas Card Throwdown Challenge. I'm hoping to join in several times throughout the year! 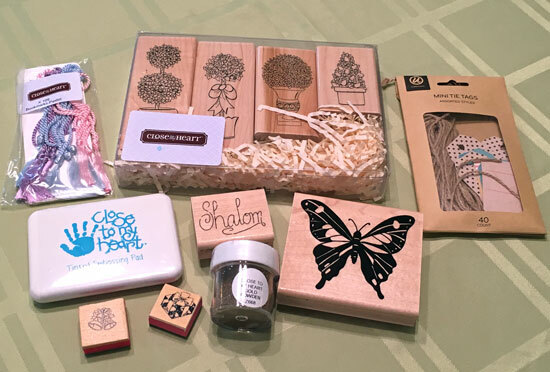 It's Wednesday and time to join in with Julia at Stamping Ground to share what's on our workdesks this week. I'm busy scrapbooking those photos I organized last week. I finished a layout yesterday just as Robbie was arriving home from work, so I didn't take time to straighten up my desk. Here's what it looks like this morning. I'll start today by adding the layout to our 2016 chronological album and putting the paper pieces in my scrap bin and returning the letter stickers to my stash. Then I'll be ready for my next project - a birthday card. I'll be using that ruler stamp and the blue ink on the right side of the desk to get started. What's on your workdesk this week? 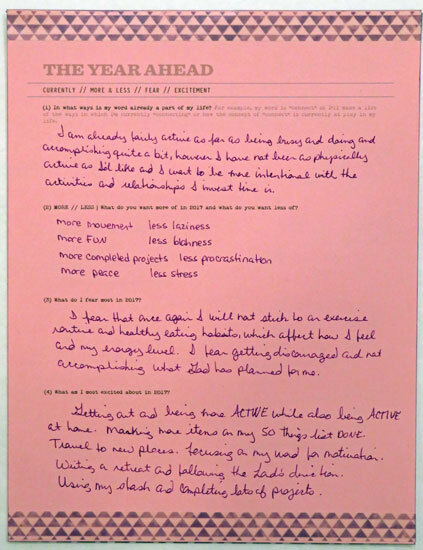 Waving to all the Mondayers joining in with Sian this year as we share a favorite piece of mail from the previous week. In the midst of the bills and advertisements last week, I received the batch of photos I'd ordered from Shutterfly. It's always FUN to find one of those bright orange envelopes filled with memories in amongst the other items in my mailbox! I also received a crafty package, although this one didn't come in the mail, it was hand-delivered - that counts, right? A friend is cleaning out her home as she and her husband prepare to spend retirement traveling in their new motor home. She found these goodies and thought I might enjoy them, so she stopped by for a quick visit last week. 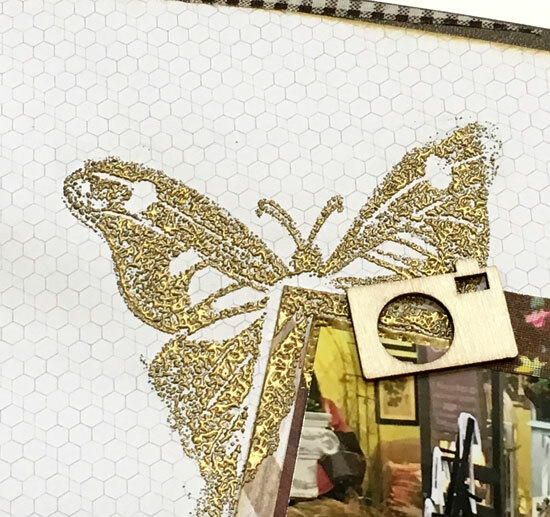 (I've already used that butterfly stamp and the embossing ink and powder on a layout.) Thanks Terri!! I didn't post any happy mail last week, but I did hand deliver a gift earlier this month when I met up with a new friend. 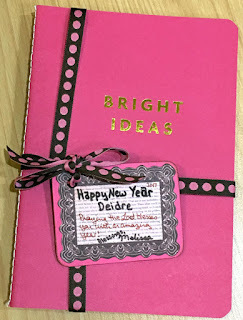 This little journal is the perfect size for slipping in a purse and jotting down random ideas, so I dressed it up with a ribbon and handmade tag. Did you receive or send/deliver any happy mail this week? There are several definitions for the word missions, but the one that I typically think of and am referring to today is " the vocation or calling of a religious organization, especially a Christian one, to go out into the world and spread its faith." I've been thinking a lot about missions lately as one of the items on my 50 Things To Do Before I'm 50 list is to go on a missions trip, so I recently chose a couple of books to read centered around this idea. Of Stillness and Storm by Michele Pheonix is a novel about a missionary family in Nepal. The story is told from Lauren's point of view. 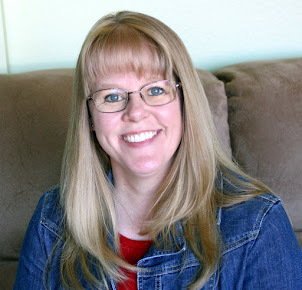 She met her husband, Sam, at a short term Bible school during their college years. After several years of marriage and the birth of their son, Ryan, Sam feels called to go to Nepal to reach primitive tribes in the Himalayas. Despite Lauren's reservations about how the move would affect their son, they spend several years raising funds and commit to a four-year stint in Nepal. The primitive conditions are difficult - no hot water, unreliable electricity, fierce rainstorms during monsoon season, etc. Sam spends three weeks at a time out ministering to the needy in remote areas, then one week at home preparing for his next trip. Lauren works at a job she does not find fulfilling, and Ryan becomes more and more distant and angry. In the midst of this, Lauren reconnects with an old friend on Facebook, and becomes emotionally entangled in his life and recent cancer diagnosis. Through flashback chapters, we learn more about Sam and Lauren's relationship, and through Facebook and chat messages, we learn about Lauren and Aidan's friendship. [Spoiler Alert - skip this paragraph is you don't want to know what happens in the end!] The tension in this family becomes even greater when Ryan walks in on Lauren talking to Aidan on Skype. He is already struggling with the fact that his dad is gone most of the time, that he did not want to move to Nepal in the first place, and now he thinks his mom is having some kind of affair. The family has been in Nepal for two years and Ryan is 13-years-old when he attempts suicide, changing the family dynamics once again. Sam and Lauren both struggle as they wait to see if Ryan will recover. He does, and Lauren takes him home to the States for therapy and rehab . . . while Sam chooses to remain in Nepal and continue his missions work. In contrast, I Am Going is a non-fiction book reminding Christians that we are all called to spread the gospel. It does not necessarily state that it will be easy, but it is a more positive look at mission work. This is a short book, broken up into chapters about going on mission: with your church, to your neighborhood, to the nations, to your job, with your job, and anywhere. Both of the authors share examples from their own missions work over the years. Honestly, I'm not sure that either of these books were extremely motivating or encouraging as we look at opportunities for a missions trip. Instead, my motivation comes from the belief that we are all called to share the love of Christ with others and my desire to step outside my usual comfort zone in serving the Lord. There are several places we've considered going as we have missionary friends in these areas - Manila, Philippines; Kenya, East Africa; Andhra Pradesh, India. However, we'll see where the Lord opens a door (hopefully) in the coming year. Have you been on a mission trip? Please share your experience in the comments! After sorting all those photos on my craft table yesterday, I was so excited to finally do some ACTIVE scrapbooking! 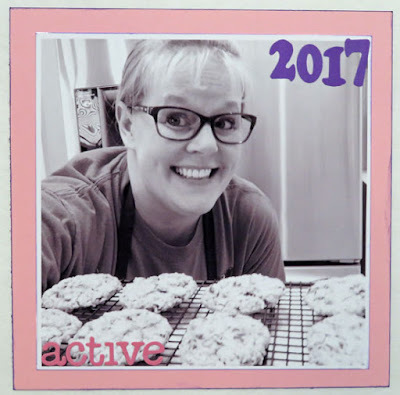 I had just read the Get It Scrapped Clean+Simple post, and I was able to use that INSPIRATION for my first layouts of the year. 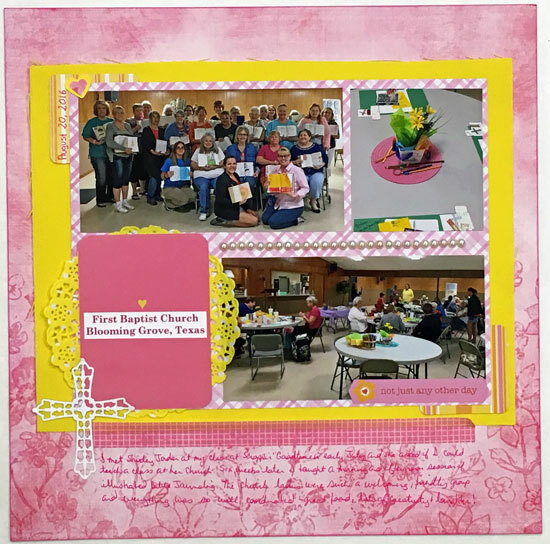 I used Megan Blethen's layout as the beginning INSPIRATION for this first layout showcasing photos from my Bible journaling workshops at First Baptist Church - Blooming Grove last year! I added a few layers and changed things to fit my photos, but that basic grid design got me started in the right direction. Next, I scraplifted Karen Poirier-Brode's layout design. I'm not sure I would call my layout "simple" as I ended up fussy cutting the title & Mary Poppins from a copy of the playbill. I also used distress ink over some of my papers after I realized that the bottom strip of houses drew the eye with its stark white background. This was a FUN page to put together. 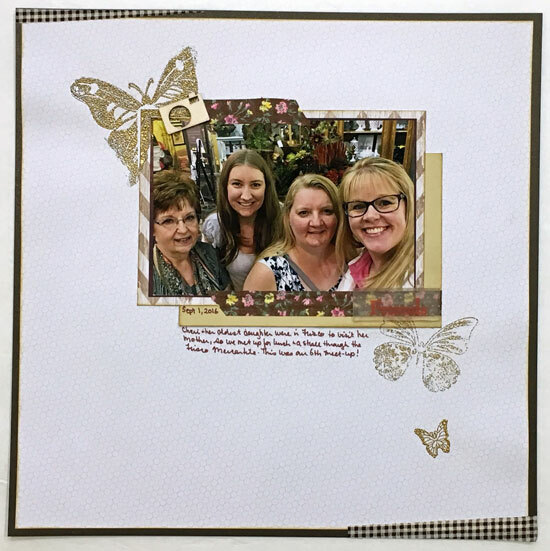 And finally, I used Kristy T.'s one-photo layout as the INSPIRATION for my friends layout. 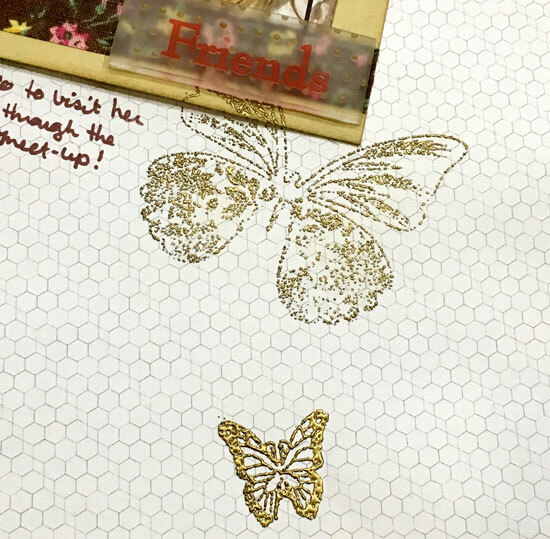 I think the stamp I used for the middle-sized butterfly was too detailed for my embossing skills, but the small butterfly came out just right. It doesn't matter to me that the embossing is not perfect; I'm just thrilled to have three more memories preserved for our 2016 chronological albums. Do you still have stories to tell from last year? I'm getting ready to scrapbook! Yesterday I got a batch of printed photos and am in the process of sorting them so that I can spend this afternoon creating layouts. 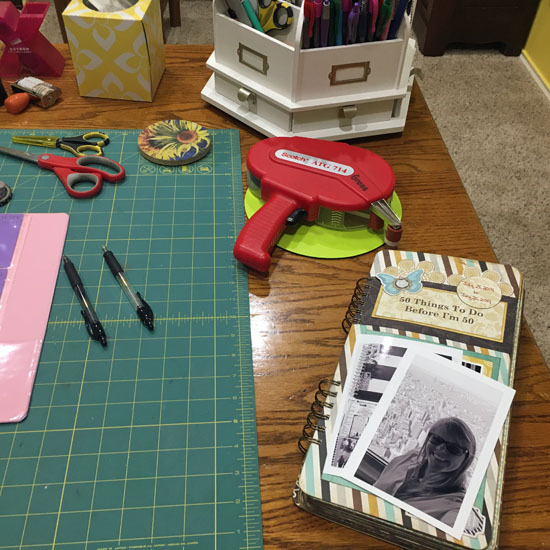 While I did a lot of scrapping last year, much of it was for custom scrapbook-for-hire projects, and I'm looking forward to being much more ACTIVE in recording our stories and memories over the next several weeks. 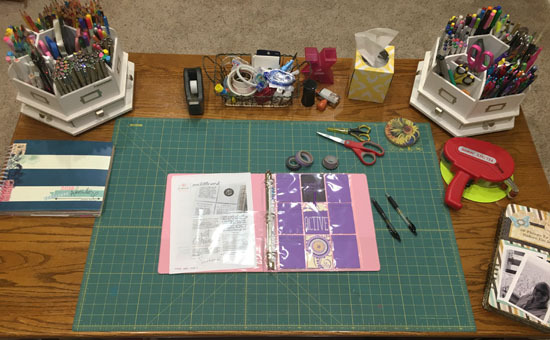 Here's a look at my craft table. 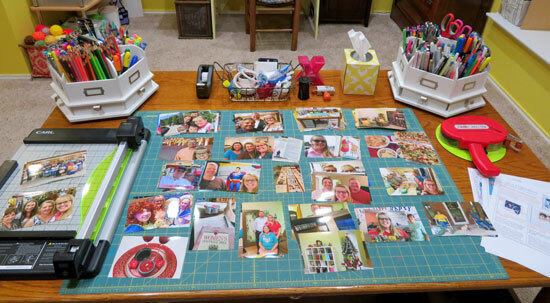 On the left of the desk, you can see the new Carl paper cutter Robbie gave me for Christmas. All those photos cover FUN memories from August through November of last year, and those papers on the right are layout INSPIRATION from yesterday's post on the Get It Scrapped blog. Now, I need to grab my memorabilia bin and add in the bits & pieces I've saved to go with some of these photos, then I'm all set to start gluing pretty pieces of paper together. 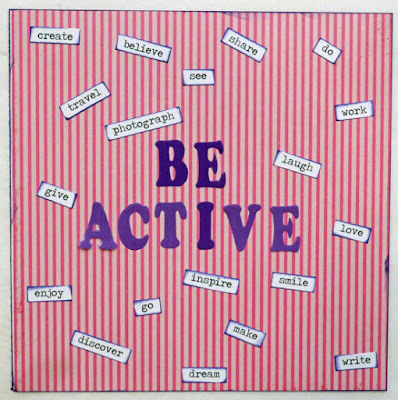 Are you doing any creating today? 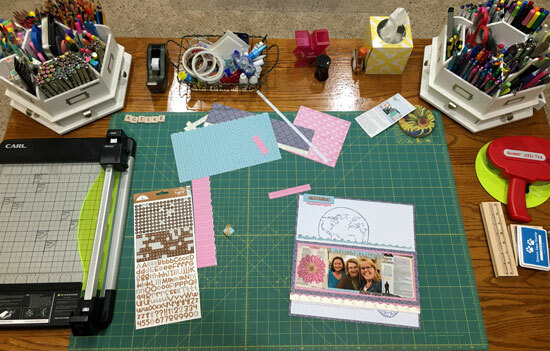 Be sure to head over to Julia's Stamping Ground to see what's on other workdesks around the world this week! Back in December, my sister Brenda and I decided to have a monthly book swap beginning in January. Brenda asked for books that are encouraging and FUN and motivating. I have quite a few ideas of books I think she'll enjoy, and my plan is to alternate between non-fiction and fiction throughout the year. Brenda felt like the biggest challenge would be hers as she tried to choose books that I hadn't already read. If you've been around my blog awhile, you know I'm an avid reader, so I'm looking forward to seeing what she comes up with each month. We agreed to send our packages to arrive the first week of each month, and we both actually mailed our January packages before the new year. 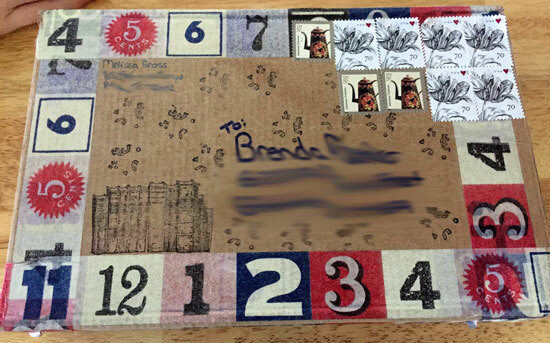 Robbie dropped my package into the mailbox at his office building on December 30, and later that same day I received a package from Brenda. Along with the book, A Complaint Free World, she sent a Complaint Free bracelet and a cute envelope and note about this book. While I've decided not to try the 21-day challenge, I have worn the bracelet several times to help me be aware of my own complaining. I admit that I'm more apt to complain first thing in the morning when I'm not quite ready to start the day, when I'm tired, and when I'm hungry. I really enjoyed this book and it's definitely made me more aware of all the complaining that goes on each day in our world. What we call news is actually Bad News. 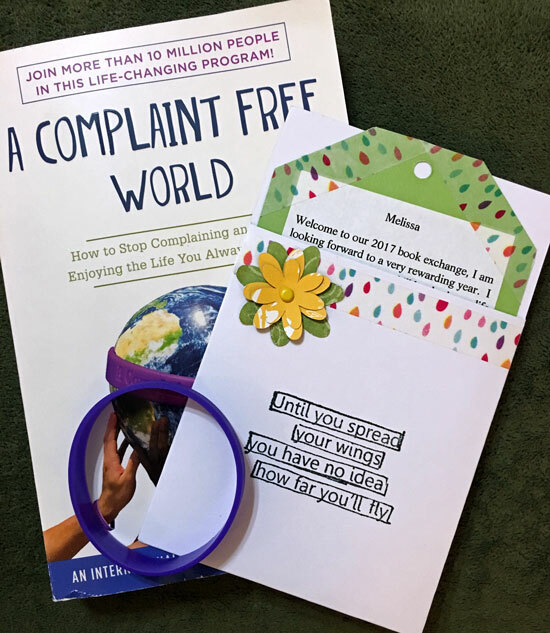 We're encouraged to stop watching, listening to, and/or reading the Bad News during our Complaint Free journey. This is easy for me, as I've mentioned before, I rarely watch or listen to the news, preferring to get a once-a-day summary via The Skimm. I invite you to consider how often complaining about illness might be an unconscious attempt to get sympathy and attention or to avoid doing something. I love this quote from Charles H. Spurgeon that the author shared as encouragement to continue working toward the 21-days: "By perseverance the snail reached the ark." Instead of complaining about a situation or social cause that needs to be changed, discern what needs to be done and then begin to speak in terms of what it will be like when the challenge no longer exists, when the gap is bridge, when the problem is solved; you will then excite people to join you in improving things. I was thrilled to receive this book from Brenda (and highly recommend it if you haven't read it)! 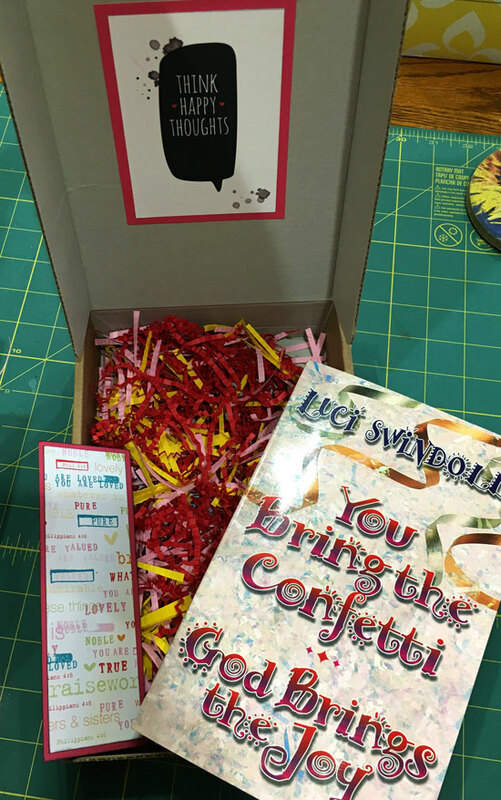 I was so excited for Brenda to receive the package I mailed out containing You Bring the Confetti, God Brings the Joy by Luci Swindoll. I found a box in our shipping supplies stash, adhered quotes inside, and filled it with paper confetti. 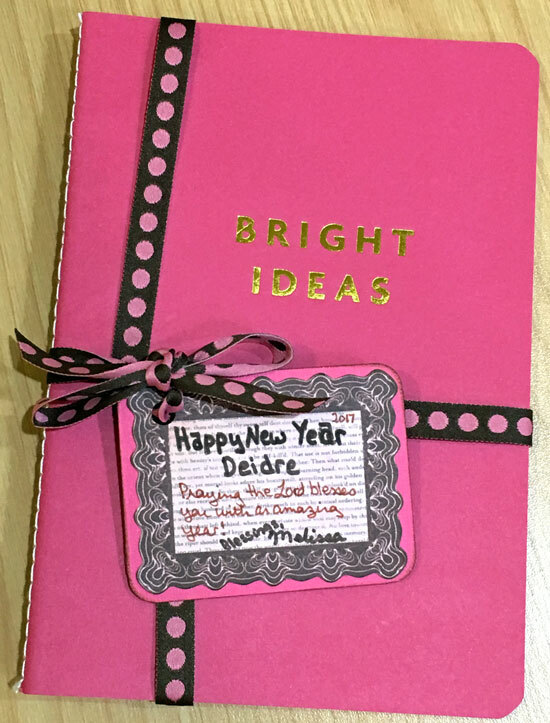 I created a bookmark and also included a note to my sister saying that I hoped she found lots of ways to celebrate life in the coming year. I sealed the box and added numbered washi tape along with confetti and book stamps. I actually forgot to snap a photo of it, but Brenda sent one when it finally arrived . . . two weeks later!!! I was so excited for her to get the book all packaged in the confetti that I was terribly disappointed when each day she texted to say "no package." 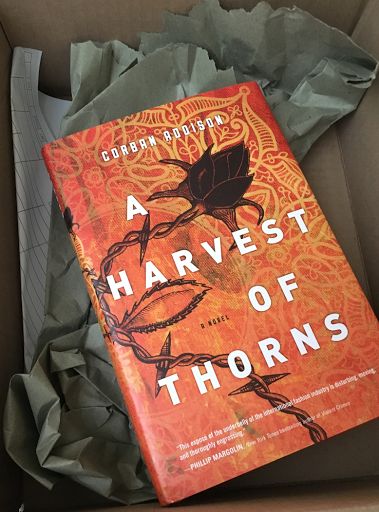 In fact, I prepared another book and sent it out right before this one finally showed up at her house because I figured this package was lost between here and there (only 5 1/2 hours away in the same state!). I was thrilled when it finally arrived last week . . . and that's why I haven't shared about it before now. You Bring the Confetti, God Brings the Joy is an older book, written in 1986 when the author was 64-years-old. I purchased this book at a Women of Faith conference in the late 1990s when I heard Luci Swindoll speak. She even autographed the book to me on the title page. It's a FUN book to read, although there are a few things that definitely date it as before the technology boom - she mentions calculators, using mail order catalogs to save time ordering gifts, and cassette tapes just to name a few. The premise of the book is to celebrate life every day, and the various chapters give ideas for celebrating now, birthdays, mealtime, camaraderies, reunions, knowledge, work, accomplishments, imagination, beauty, America, and God. I especially like her reminder to learn just for the FUN of it and to celebrate your loved ones home. 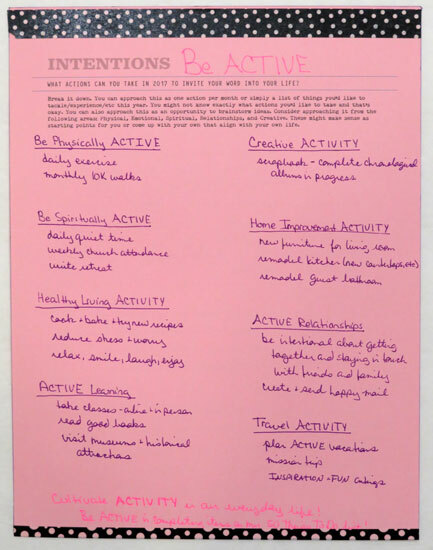 As I was re-reading the book before mailing it off to Brenda, I made a list of ideas for celebrating during my ACTIVE year, including celebrating my daily exercise (I actually applaud myself when I've completed a session here at home now!) and planning ACTIVE birthday trips and more outings with friends. My favorite quote comes early in the book when Luci shares the party "scripture" she made up as a little girl: Verily, verily I say unto you: thou shalt find a party at the end of this street. Turn not to the right nor the left, but direct your steps toward it. Great will be your fun upon arrival. Walk ye in haste. I also appreciate her reminder that: We are most appealing to others, and the happiest within, when we are completely ourselves. I'm looking forward to this monthly book swap, and I'll be sharing the packages I send and receive throughout the year. Did you receive any happy mail this past week? A huge thanks goes to my Pun'kin niece Natashia who helped me record this video during her visit in December. Thanks for watching! Last week, my first time to participate in What's On Your Workdesk Wednesday, Julia commented...your desk is very neat...is this because of the staging, or is that how you work? That photo was staged, however I typically keep my table fairly neat. It does get messy when I'm in the midst of a big project, however I always clean up between projects. Here's an overhead shot of my craft table today, which actually holds three projects. On the left of the table is my 2016 Gratitude Journal, which I completed a few days ago. I haven't moved it to our Memories Shelf yet because I want to read back through it first. It's so much FUN to take time to enjoy finished projects, isn't it! In the middle of the table, I'm working on the January prompts in the One Little Word class. I've chosen a binder, added a few page protectors, and printed the handout and other elements. I'm hoping to add my journaling, a photo and some embellishments later today. On the right side of the table, I have my 50 Things To Do Before I'm 50 mini-album and two photos that need to be added to it. 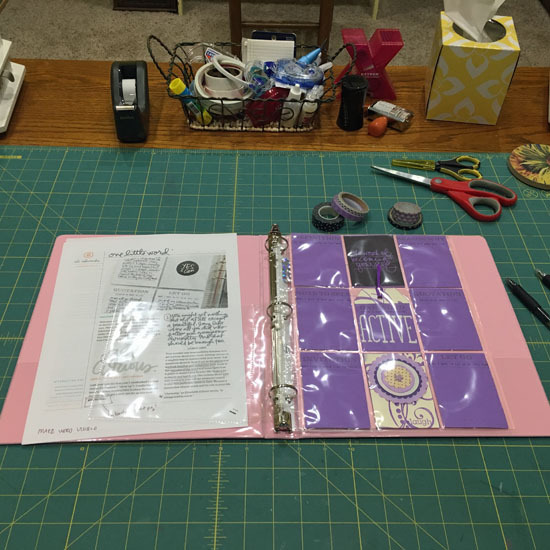 This album has a page for each of the 50 items, and once I complete an item, I add a photo, the date, and two lines of journaling to the page. I need to complete the pages for my trip to the top of the Empire State Building and completion of the Gratitude Journal. I'm hoping to have all three of these projects off my table in the next day or two, then I'm planning to create some layouts! 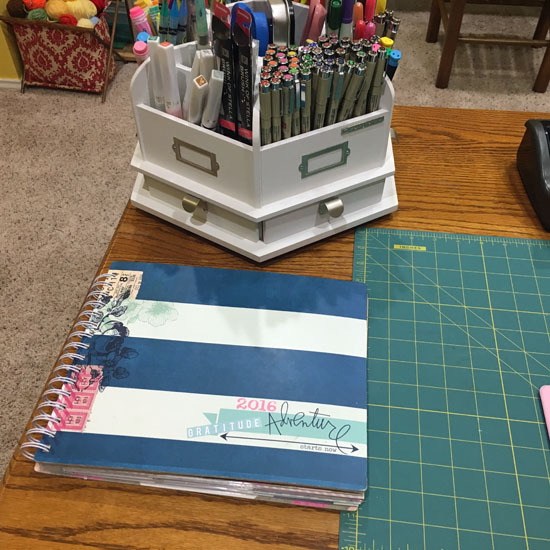 Head over to Julia's Stamping Ground to see what's on other workdesks around the world this week! 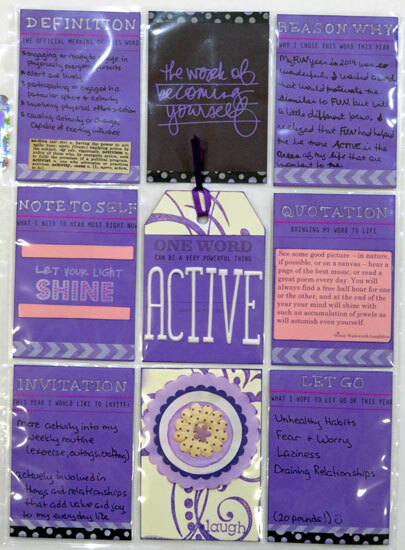 Joining in today with Sian's new Monday post idea to share our "favourite piece of post from the previous week." 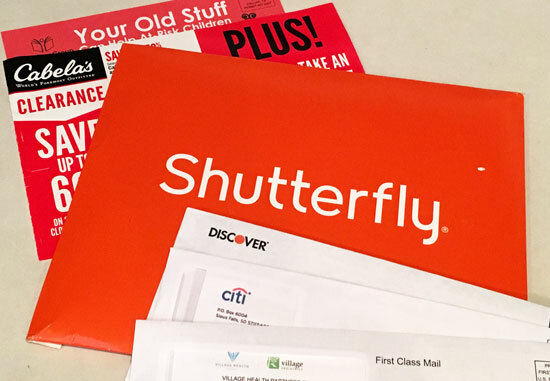 I think it will definitely be interesting to see what bloggers around the world find in their mailboxes each week. In the mail last week, I was delighted to receive two holiday/new year's cards - one from Rinda and a small one with a lovely note from Alexa. 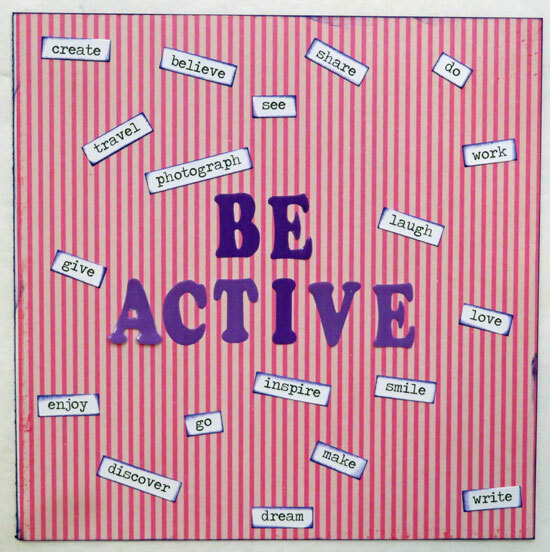 As I'm striving to be more ACTIVE this year, I plan to create and send more cards and happy mail. 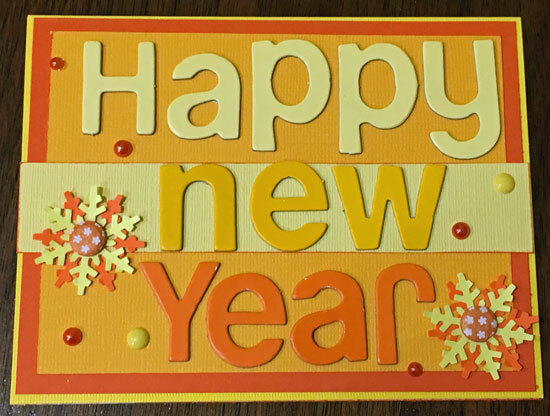 I began last week by sending two handmade cards - a birthday card (which I forgot to photograph before mailing) and a Happy New Year thank you card. Waving to the other Mondayers a little late this week, but hoping to join in often this year! Did you find any happy mail in your box last week? 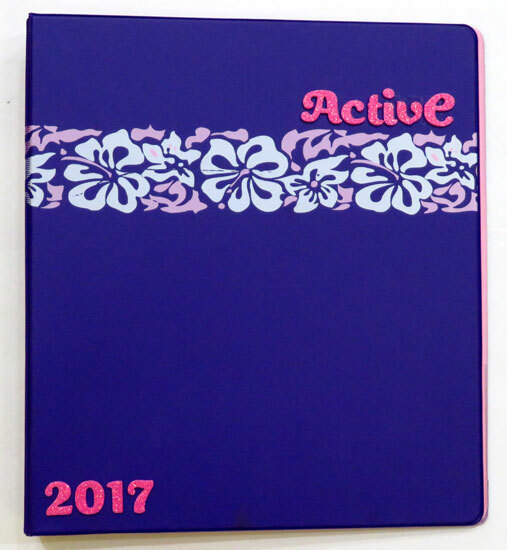 Today I'm marking another item DONE on my 50 Things To Do Before I'm 50 List - #30 Keep a daily diary/gratitude journal for one year. Each day of 2016, I recorded something I was grateful for in my Gratitude Journal. I had hoped to complete the additional pages in the journal at the end of each month, however I occasionally had to complete several months at one time. 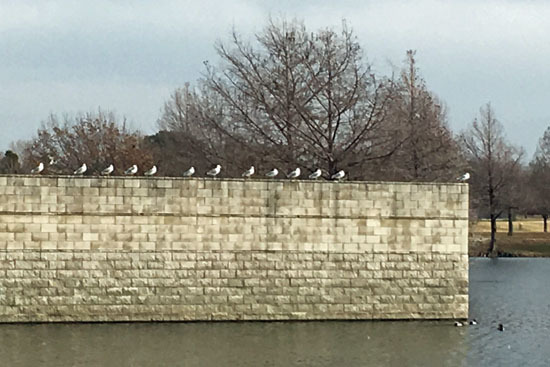 I've shared the first eight months' pages in previous posts (January, February, March, April/May/June, July, August). This past weekend I completed the pages for the final four months of the year. 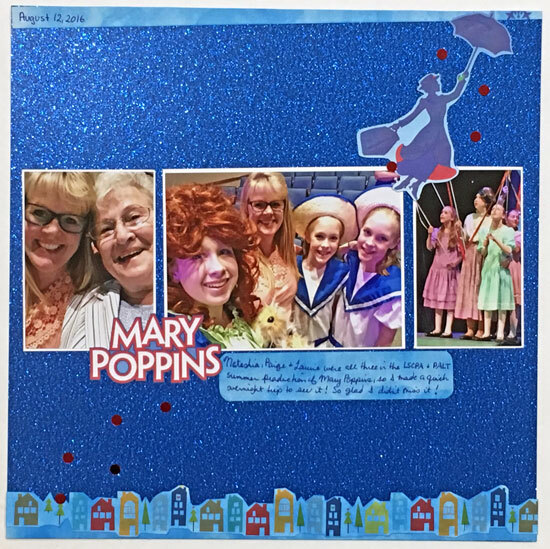 I added some collage elements, including the front of one of our anniversary cards this year, to the final page and inside back cover to complete this project. I truly enjoyed the daily recording process as well as putting together the additional pages in this album each month. It was so much FUN recording all these little bits & pieces of our lives, and I'm excited to have another items checked off my list!